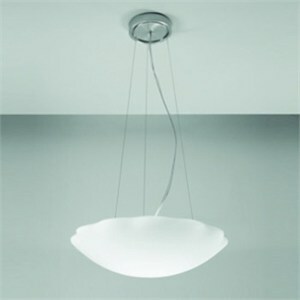 Cloud-like pendant highlighted by a scalloped hand-blown glass diffuser available in 2 sizes. Halogen light source provides upward and diffused illumination. Mounts directly to a standard 4" junction box. Metal canopy in brushed nickel finish. S60- 23.5"D X 5.5quot;H; 78.75" overall height (field adjustable). Uses 1 X 300W 120V R7s 117mm linear halogen.